Stop the hop! Get your pets on an annual flea and tick preventative today! Protect your dogs heart this spring with a heartworm test! Get 30% off the test when you purchase 1 six month supply of heartworm preventative. When it comes to caring for your pet, we know you want to get them the best care available. Both Dr. Richard A. Barta and Dr. Kevin Cooper have almost 60 years of combined experience. Our goal is to provide the best veterinarian care in available. 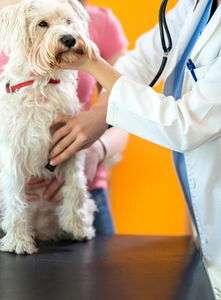 Give your pet the veterinary care it needs by visiting us today. Count on us when your pet needs a surgery, ultrasound, vaccinations, radiology (X-Rays), and micro-chipping. We have the facilities to treat large animals and to make country calls for your convenience. Visit us today. Refer a New Client and you Will Both Save $10 on your Next Visit! "I love the staff at Barta Animal Hospital. They are always so kind, efficient and professional. Thank you so much!" "We love Barta Animal Hospital!! Dr. Barta and Dr. Cooper are the best, very compassionate and knowledgeable. They have always made us feel like our animals were as important to them as they are to us!" "Every time I have been to your clinic has been a great experience! The staff is outstanding! Thanks for all that you do!" "Every one at Barta's is very helpful & answered all our questions. We always get our questions answered on the phone too. Our fur babies are always treated with loving care. We are glad Barta was recommended to us!"